After this prayer is said, the petitioner states their specific need and then the candle is lit. But Rue has other religious connections as well. It is also called “herb of grace,” or herbygrass and was used in the early Roman Catholic Church to sprinkle holy water on the people during worship. In the Middle East hyssop is traditionally used instead of Rue, but some believe Rue was used in Europe because it had antiseptic properties. This Roman Catholic custom may have been adapted from an ancient Roman ceremony where weapons, flags and the like were “purified” by waving a laurel branch over them. 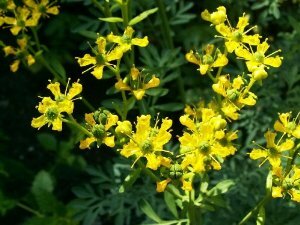 The scientific name of this ancient herb is Ruta Graveolens. Ruta was the Latin name of the herb when the Romans introduced it to the English. It was eventually Anglicized to Rue. Graveolens is Latin for “a strong or offensive smell.” Personally, I think it smells just fine! One of my mentors, Byron Ballard, calls rue “rocket fuel” and can be used to strengthen any magical intention. It is definitely one of my go-to herbs and I always keep a little rue oil handy for a variety of magical uses. Great stuff! This entry was posted in Creation Spirituality, Herbology, Prayer and tagged Spirituality, Wicca. Bookmark the permalink.